There was no class due to the holiday. 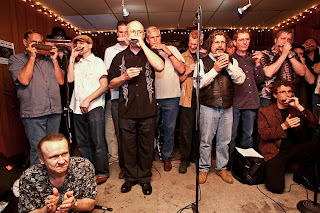 But, if you weren't out to the 12th Old Town Harmonica Recital Friday at the Harlem Avenue Lounge, you missed a great show! Turnout was fantastic and people were good about staying late so the last players had an audience. Everyone showed great signs of personal improvement and performed better than ever. 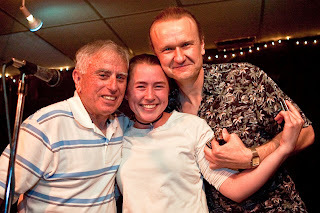 Special thanks to Michelle Weese for her work recording, to Joe for putting it all on, and to Kenny Zimmerman of the Harlem Avenue Lounge for hosting once again. Special moments? How about Shoji's student Little Jeff getting up and doing a great job on the melody of "My Babe"? Also, in an incredible show of harmonica fanatacism, we were honored to have Jerry Devillier and his buddy Jasper Manuel drive all the way up from Louisiana just for our recital! 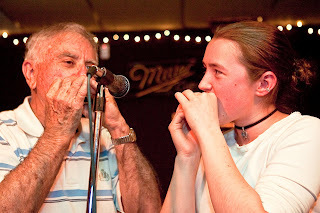 You were sleeping if you didn't think his performance with Zoe wasn't one of the great musical moments of 2009, the Cajun harmonica playing expert, Jerry Devillier joining Zoe Savage and Joe Filisko onstage for "La Valse De Cherokee". Also, kudos to Shoji Naito for his work arranging two great harmonica ensembles for the recital, "Welcome Table" and "Soul Finger". It was great fun and even featured an impromptu performance by the Soul Fingerettes, Laura, Rita and Carolyn! Thanks to Highway RickEy, Big Alex, Shoji Naito, Jerry Devillier and Grant Kessler for wielding the Highway RickEy camera and capturing the night. You can relive the night in photos here: Recital Photos. Shoji's so excited about how well we performed "Soul Finger" that he's taking it on the road. The class is scheduled to be part of the Old Town School's First Friday performance in the main auditorium on Friday, June 5 at 7:30pm. Keep practicing your part and come on out to play it again if you can. Buy and download Shoji jam tracks at youmissedmonday.com.